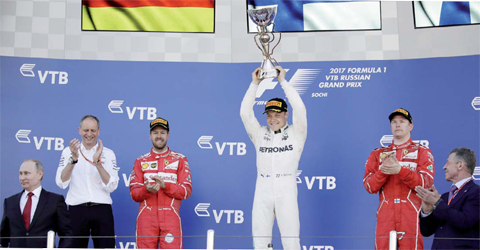 SOCHI: Valtteri Bottas claimed his maiden Formula One victory yesterday when he resisted intense pressure from championship leader Sebastian Vettel to triumph for Mercedes in a tense Russian Grand Prix. The Finnish driver, starting from third place on the grid, grabbed the initiative at the start by powering past both Ferraris and into the lead while his Mercedes team-mate Lewis Hamilton struggled home fourth. Four-time champion Vettel finished second ahead of Ferrari team-mate Kimi Raikkonen who claimed his first podium finish since last year’s Austrian Grand Prix. The popular Bottas’s first win was warmly received by his fellow drivers and the paddock, Hamilton hugging him after he had jumped into the arms of his crew and Vettel joining the reception, Russian President Vladimir Putin also present for congratulations and prize giving. “Worth the wait!” said the unflappable Bottas in typical understated style after coming home just six-tenths of a second ahead of Vettel at the flag. Dutch teenager Max Verstappen finished fifth for Red Bull ahead of Mexican Sergio Perez and his Force India team-mate Esteban Ocon, German Nico Hulkenberg of Renault and Brazilian Felipe Massa of Williams. The result lifted Vettel clear at the top of the drivers championship with 86 points ahead of Hamilton on 73 with Bottas up to third with 63 points. Mercedes lead the constructors title race with 136 points to Ferrari on 135 after four rounds of this year’s championship. Bottas became Finland’s fifth Formula One race winner following Keke Rosberg, Mika Hakkinen, Kimi Raikkonen and Heikki Kovalainen, who was the last from the Nordic country to triumph, at the 2008 Hungarian Grand Prix. Vettel was seemingly as pleased for Bottas as if he had won himself. “I tried everything to catch him and I thought there would be an opportunity on the back straight,” the German said. “I thought I could do it, but I wasn’t sure what Felipe Massa would do and I ended up losing out. It doesn’t matter though. Big congratulations to Valtteri. This is his day.” Raikkonen said: “I have had a bit of a rough start to the season, but this week has been a step forward, but we still only finished third. So, we’ll keep trying.” On a balmy Spring day by the Black Sea, two-time champion Fernando Alonso was an instant retirement before the start when the Spaniard abandoned his troublesome McLaren Honda. This delayed the start for an additional formation lap before Bottas made his exhilarating getaway. Almost immediately, Frenchman Romain Grosjean of Haas collided with the Renault of Briton Jolyon Palmer at Turn Two, the cars crashing heavily to trigger a red-flagged halt and a Safety Car intervention.